Time for another link round up! One of my 2019 blogging goals is to share resources throughout the year that support library staff working with children. These will be short and quick. Here’s what caught my eye in the last few months related to youth services. What’s been on your radar? Let me know in the comments! Did you see we are on Instagram now?! We’d love to connect with people there so feel free to follow for storytime content and more. If you haven’t already signed up for The Cardigan newsletter then you are missing out. These gals are rocking it! CanLit for Little Canadians shared a huge list of upcoming 2019 Canadian books for kids and teens. Can’t wait to get my hands on these! If you do any sort of programming where you play music then definitely check out this list of great new music for kids by Library Makers. ALSC offers all of their live webinars for free to anyone! There are lots of good ones coming up, and I’m especially looking forward to the ones on child development, serving refugee families, and music and movement in storytime. The Wild Wisconsin Winter Web Conference (try saying that three times fast!) is coming up and there is a youth services track featuring three free options. My fellow Canadian all-star blogger Karissa shared her program details on how to teach kids to play the ukulele. The Buckeye Librarian gives you all the details on how to plan a STEAM program for preschoolers called Little Scientists. This one is perfect for Dinovember! What is Bridget Reading? 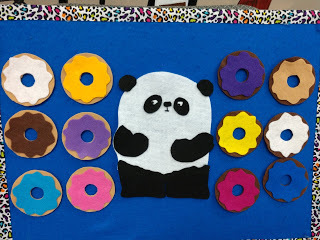 shared the most adorable Panda and donut felt story that pairs perfectly with the books by Steve Antony. Let me know of your recent favourite read or discovery related to children’s librarianship! Hi, thank you so much for sharing your expertise – I present storytimes at our local library and get ideas from your websites a LOT. As thank you, I wanted to share one that is popular in Japan. It was easy to translate, and the children really liked it. And no worries, you already know the tune. Works better with older toddlers and preschoolers. How creative! Thank you so much for sharing this, Yoshiko! I feel so lucky to have a community of online peers who are willing to share their ideas. I think this would work perfectly with kids in grades K – 2 as well.